Read the sections below to learn how the AENEAS project integrates into the global effort to design and built the world's largest radio telescope - the Square Kilometre Array. The Square Kilometre Array (SKA) is going to be the worlds largest largest radio telescope once completed sometime in the first half of the next decade. The SKA will use thousands of dishes and close to a million low-frequency antennas to create an effective collecting area of over a square kilometer (one million square meters). Using the SKA astronomers will be able to monitor the sky in unprecedented detail and survey the entire sky much faster than any system currently in existence. The SKA is being built in South Africa’s Karoo region (350 MHz to 14 GHz) and Western Australia’s Murchison Shire (50 - 350 MHz). The SKA will be able to conduct transformational science, which will deepen our understanding of the physics of extreme gravity, how the first starts and galaxies were formed, what dark matter is and more. SKA science operations are planned for mid 2020s. The SKA is led by a consortium of 10 member countries with a total of close to 100 organisations across about 20 countries which are participating in the design and development of the telescope. The SKA is a new class of telescope referred to as a "software telescope". It will require supercomputers faster than any currently in existence , and network technology that will generate more data traffic than the entire Internet. The model adopted by the SKA for its data delivery and science support is similar to that of other successful large infrastructures, in particular CERN. 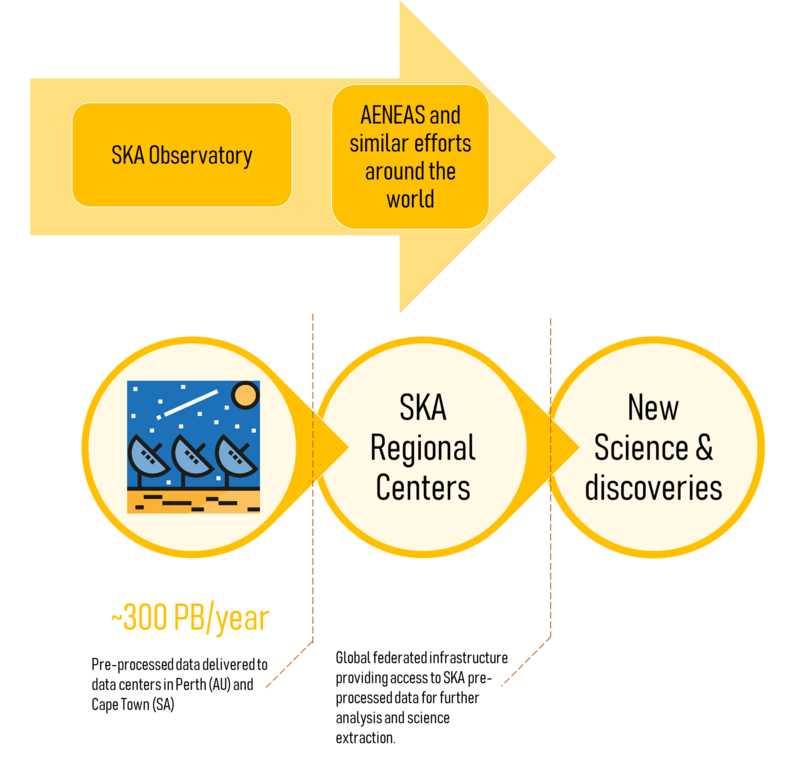 The SKA Observatory (SKAO) is expected to produce an archive of standard data products with a growth rate on the order of 50—300 petabytes per year. These products will be delivered to the international scientific community via intercontinental networks using SKA Regional Centres (SRCs) distributed across the globe. These regional centers, which won't be directly supported by the SKAO will offer further access,computing and storage resources, which are vital to enable the community to take maximal advantage of the scientific potential of the SKA. Therefore, SRCs will form an intrinsic part of SKA operations and be the working interface for most scientists using the SKA. As such, national investments in a distributed SRC across Europe could represent a significant contribution to SKA operations. As the primary interfaces for extracting science, the ultimate success of the SKA will be directly coupled to the capabilities of these SRCs. The AENEAS project is a European investment in the development of a network of SRC that will form a federated European Science Data center for the SKA. Similar efforts are ongoing in Australia, South Africa, China, India and Canada. The European Science Data Center along with similar centers planned around the world will ultimately connect the SKA Observatory with the astronomy community and facilitate the extraction of science results from the wealth of SKA data. 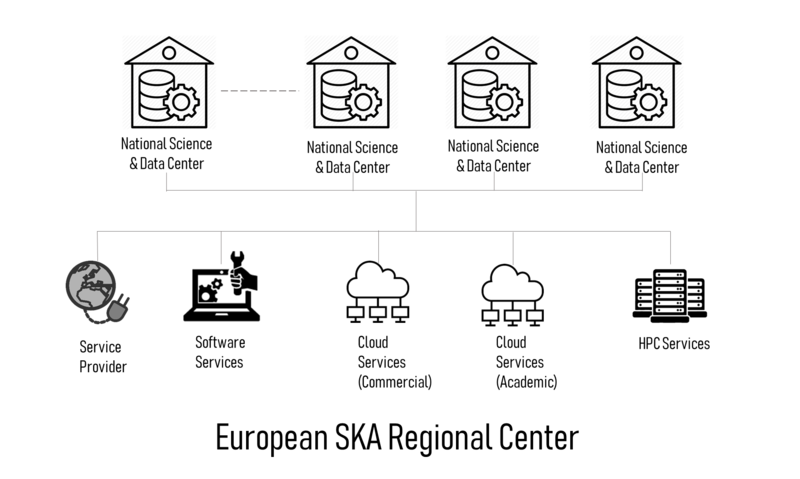 Each Regional Center will in turn consist of multiple smaller national data centers. AENEAS aims to provide a comprehensive design for the European SKA Regional Center - a large-scale, distributed European Science Data Center will provide the European astronomy community with the scale of computational infrastructure necessary to maximally exploit the scientific potential of the SKA. . The distributed European Science Data Centre will function as the European hub in an interoperable, global network of SKA Regional Centres. All data, code, tests, documentation, and reports produced under the auspices of the AENEAS project will be made freely available under an Open Access and open source policies. The AENEAS partners will leverage existing products, technologies, services, best practices and standards offered by European e-Infrastructures and integrated e-Infrastructures worldwide. By partnering with existing EC e-infrastructures such as GÉANT, EGI, the EURO-VO, and participating in initiatives like the RDA, AENEAS can take advantage of expertise beyond radio astronomy from the wider astronomical community and even other research domains, and reuse relevant open source technology, existing services, processes, tools and knowledge. 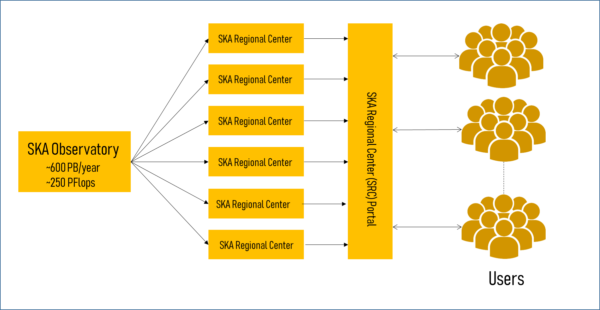 The European SKA Regional Center will be a network of distributed national science and data centers across Europe connected via existing European-wide infrastructure and services.